Q: I’m thinking of making gifts this year. What do you suggest? A: Handmade gifts are always popular because they show the heartfelt thought and effort that you put into choosing and creating the perfect, unique gift. Advent calendars are fun gifts to give and create ahead of the holidays, and gifts like a set of cards, homemade treats with decorated bags, holiday banners, and calendars are ideal for a variety of people and budgets. The ever-popular tradition of opening a door a day to get a piece of candy, a special quote, or even a suggestion of a fun holiday activity can be made even more fun when you create a custom Advent calendar. The detailed Advent calendar on page 36 of the Holiday Mini Catalog uses the Peekaboo Frames Bigz L Die (#124587) and the 25 & Counting stamp set (#123792 wood mount, #123794 clear mount). This makes a great format for sharing the Christmas story or suggesting holiday activities like cookie baking and decorating the tree. If you prefer a different type of Advent calendar, try the Matchbox Bigz XL Die (#114890) to die cut Frostwood Lodge Designer Series Paper (#124002). Stack and glue the boxes in a square or in the shape of a Christmas tree and fill each box with small gifts or candy. For less expensive gifts that are perfect for neighbors, co-workers, or for children’s classes, you can make homemade candy or cookies and package them in our skinny Cellophane Bags (#124134). Add a stamped topper to the 1” x 8” tube and you have a unique and yummy gift that anyone will appreciate. For larger items, we also have rectangular cellophane bags in three sizes: 3” x 5” (#103104), 4” x 6” (#102757), and 6” x 8” (#102210). Or create quick & easy, custom decorated boxes using our Kraft Gift Boxes (#124106) as your starting point. Wrap with our 1-1/4” Striped ribbon and add a hand-stamped tag and you have a great gift. For those special people on your list, you can step it up a bit and create a custom holiday banner using the Holiday Stocking Bigz L Die (#124098) and coordinating Stocking Accents Originals Die (#124099). Use die-cut or chipboard letters to put a family name or a message like “Joy” or “Merry” on the banner with one letter per stocking. String the stockings on a Satin ribbon with the adorable and functional Mini Clothespins (#122942). And everyone needs a great calendar for 2012. You can create a custom calendar using our digital paper crafting software, My Digital Studio (#118108). The great thing about using My Digital Studio to make a calendar is that you can completely customize each page with your favorite designs or use one of our designer templates to save time. Make the calendars extra special when you add photos of your family members on their birthday or anniversary dates. Plus, you can design once and print as many as you like! Or design once and then just tweak it a bit to customize the calendar for different families! There is a joy to creating and giving a handmade gift that is extra special. Store-bought gifts just don’t have the same heart as something that you designed and created with someone special in mind. Plus, you get the added benefit of slowing down and enjoying the experience of creating that gift without having to fight crazy mall crowds or stormy winter roads! Contact me today to plan your holiday gifts and you can get started with the fun and festive process of creating your heartfelt, holiday gifts! © CraftyPerson Production. Images © Stampin' Up! 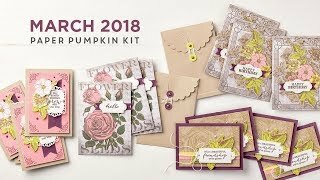 First Time Ever - Four NEW Sale-A-Bration Products for March! 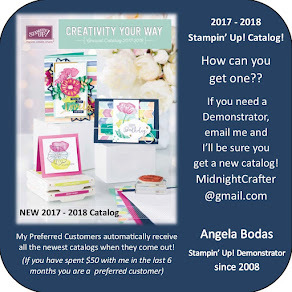 Comments or questions regarding the content of classes, services or products offered on this blog should be addressed with me, an Independent Demonstrator of Stampin’ Up!. All offerings outlined on this site may not be supported directly by Stampin’ Up!